11/30/2013 ~ Celery is a good veggie to grow indoors. It seems quite happy indoors, even without special attention to light, like getting Solatube, as I did. This celery was outside on the deck where it lived through a foot of snow and 17* temperatures overnight. When I brought it in, it added new growth almost immediately. In the foreground is Celery Tango. It makes proper celery stalks, if you give it a chance. Mine tends to get eaten before the stalks fully mature. I also have Celery Safir, which looks a lot like parsley, with little stalks, the size of parsley leaves. 1/16/2014 ~ The celery in the pot at the back did practically nothing, if there was any growth at all after its initial spurt following being brought in from the cold, until about a week ago when I moved it to the side of the room opposite the Solatube. I moved it because I had discovered that Solatube light on the far side of the room is almost 1000 Lux. With that knowledge, I decided to try some plants on my desk. I had my friend move my Laser Printer, which I wasn’t using since my batteries for my Solar Electric are no longer strong enough to support the 750 watts to run it. In its place I put the pot of celery at the back (above) and a pot of garlic. 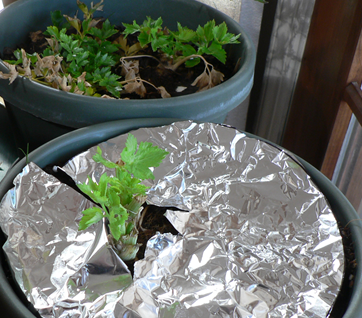 Then, I thought that I should add a piece of insulation, tinfoil side facing the plants. I did that, which was almost immediately. And, right away it looked as if the celery was responding. 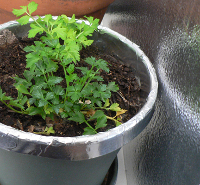 I wondered if the celery would like even more tinfoil, so I used the foil tape that came with my Solatube, but hadn’t been needed in its installation, and put it around the inside and outside of the celery pot’s top. Today the growth seems evident, so I took a picture. I’m wondering now whether I should get more foil tape and cover the whole outside of the pot, given that I’ve since added a pot of arugula to the desk top garden. By covering the outside of the pot, I would be giving the arugula the same benefit, it seems to me, that the celery gets by being right next to the reflective tinfoil surface.